Most Americans, especially those whose immigrant ancestors passed though New York City, are familiar with Ellis Island and the part it played in processing the new arrivals, especially those who were possibly ill with a contagious disease. But, long before Ellis Island there were many such places. 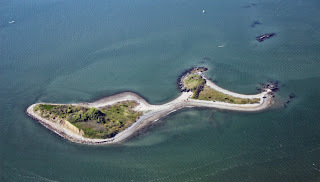 I was surprised to see that one of my ancestors died on a Island in the Boston Harbor called Rainsford Island. Her named was Cynthia Thornton Brown. She was born in 1812 in Thornton, New Hampshire. Cynthia married a local man, Obadiah Brown, and the eventually settled in Boston. In May of 1856 she contracted the deadly disease of small pox. Cynthia was transported to the Island, located in the Boston Harbor to live or die. She died. Rainsford, as I said, is very small, only about eleven acres and has an elevation of 49 feet. It had been used by the Native Americans prior to the arrival of English colonist. In 1632 it was given to Edward Rainsford who used it to raise cattle, safe from hungry wolves and poachers. In 1737 the town of Boston to use a place of quarantine. Ships coming into the Boston harbor who drop off any sick sailor or passenger, complete with their bedding and clothes. If you lived you left, if you died, you were buried in an unmarked grave. The Island was used for various additional purposes in the ensuing years. Boston sent it's desperately poor there to live in almshouses. A boy's school was established, called the Suffolk School for Boys, it remained open until the 1920s. When there was no contagion on the island, the caretakers could rent out holiday houses to Bostonians. Today there are no remaining buildings on the Island which is reachable only by private boat. It is part of the Boston Harbor Islands National Recreation Area. Many of the colonial east coast cities had their own quarantine island. While Philadelphia did not have a quarantine Island, it did have a large facility, called the Lazaretto located just outside the harbor area. The word Lazaretto is Italian and is defined as a maritime quarantine station. The building, erected in 1799, still stands and is near the airport. This 217 year old building is the oldest surviving quarantine hospital in the United States. It was built shortly after the terrible yellow fever epidemic of 1793 during which about 5,000 people died. The building was listed in the National Register of Historic Places in 1972. New York City had multiple quarantine Islands. North Brother Island is in the East River between Rikers Island and the Bronx. Beginning in the 1880's it was the site of Riverside Hospital, the ruins of which still stand on the abandoned Island. This was the eventually home of the cook, Mary Mallon, famously known as Typhoid Mary. She infected 51 people before being quarantined, for the rest of her life. The federal government built several man made island in the lower New York Bay for the purposes of quarantine. Swineburne and Hoffman Islands housed victims of cholera epidemics, the last of which was in 1910-1911. New York also had quarantine ships to house infected people. 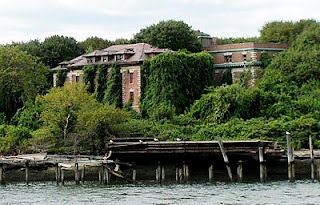 North Brother Island is a bird sanctuary, owned by the City of New York. Swineburne and Hoffman are managed by the National Park Service and is off limits to the public. There are multiple islands off the coast of Maine that were once used for quarantine. Widows Island, a 15 acres land mass off the shore of North Haven was used to house yellow fever victims. Wood Island was used by the U.S. Navy for the same reason. Hospital Island in the Passamaquoddy Bay is a tiny three acre island that was used in 1832 to isolate ship passengers with cholera. Thankfully, the days of rampant infectious disease are behind us. I can only imagine the pain and suffering felt by these people. What was Obidiah thinking when his wife Cynthia Thornton Brown was taken to Rainsford Island? He would never see her again. Did someone come by and tell him she had died?